The world is changing. The emerging risk landscape in almost every industry vertical has changed. Effective methodologies for managing risk have changed (whatever your perspective: internal audit, external audit/consulting, compliance, enterprise risk management, or otherwise.) Finally, technology itself has changed, and technology consumers expect to realize more value, from technology that is approachable, at lower cost. How are these factors driving change? Data-Driven GRC represents a consolidation of methodologies, both functional and technological, that dramatically enhance the opportunity to address emerging risk landscapes and, in turn, maximize the reliability of organizational performance. In this webinar, Phil Lim, ACL Product Manager, and Dan Zitting, VP of Product Strategy and Design, ACL Services, will discuss key opportunities to leverage change, both from a risk and organizational perspective. 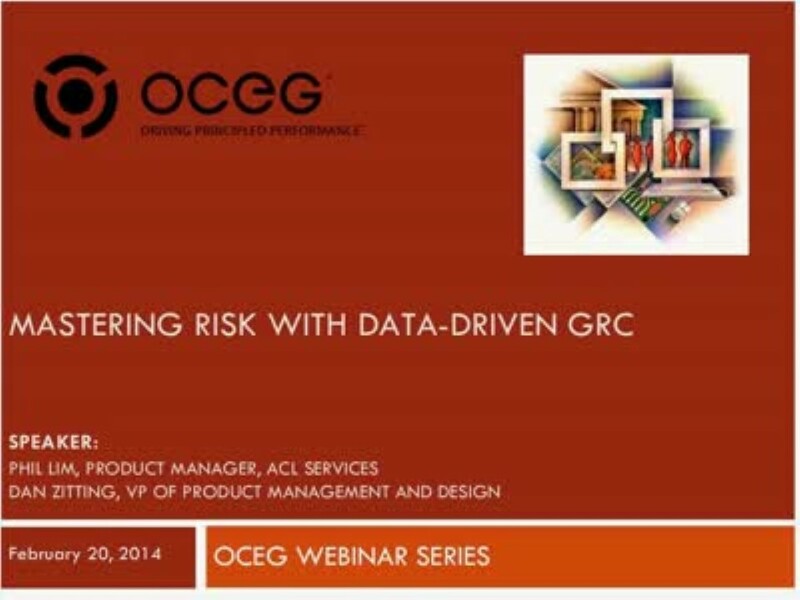 We have emailed instructions to access Mastering Risk with Data Driven GRC to . Make sure the email arrives in your inbox: either add "support@oceg.org" as a safe sender to your email platform, or if you use Gmail, drag our email into your Primary tab.